This is an early Simon and Halbig doll made for the French Market. She has a perfect bisque head with lovely colouring, large open and close eyes with full eye wax and silk eyelashes. Her ears are pierced. She has her original card pate and her hair is a lovely real hair French wig replacement. The back of her head has the red Wimpern stamp. Her body is in reasonably good condition with some rubbing around knee joints etc and repainted hands but generally its very good. 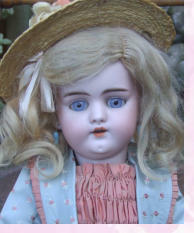 She is a really pretty doll, measures 24 inches and dates around 1900. Telephone 020 8367 2441 Mobile 07970 722750 All prices include postage and packing within the UK. Layaway is available. Please ask for details.